I will talk mostly about utility patents, briefly discuss design patents and say nothing about plant patents. How is that for honesty? As an example, let’s say I want to make a better mouse trap. No way am I going to get a patent for just “a better mouse trap.” Too vague and too abstract. Frequently, mathematical algorithms are not patentable because they are considered an abstract idea. Software and business methods were once considered abstract ideas, however, they are now patentable. Scientific laws that reflect nature such as Einstein’s E=MC2 do not make the grade nor Newton’s Law of Gravity. A newly discovered mineral, such as Uranium, is not patentable. This is a part of nature and thus not patentable. In conclusion, Congress wants just about everything to be patentable as long as they fit into the four categories listed above. They have provided some very small limits as to what cannot be patented. How long is an idea protected under a patent? A patent protects an idea for a period of 20 years from the date an application is submitted. Does a patent give me a monopoly? A patent does not give me monopoly, instead it allows me to prevent anyone else from making or selling my invention during those 20 years. This seems odd doesn’t it? Isn’t preventing anyone else from making or selling my idea giving me a monopoly? No. I don’t actually have to make or sell my idea to get a patent. Here is how it works. Do you see now why a patent does not give you or me a monopoly? In order for you to make, sell, and distribute your improved duffel bag with rollers you must go through me. I own the patent for the original duffel bag and you own a patent for the improvement of adding the rollers. There are now two patents at work. If a third party wishes to make, sell, and distribute the duffel bag with the rollers he has to go through both you and me. Neither one of us has to actually make the duffel bag. As long as we own the patents for that design, everyone has to go through us. I recommend that you hire an experienced patent attorney because he or she has been through the process many times before and thus there is less chance for costly errors. For useful the question is asked “Does it have a useful purpose and does it work?” It must work and not merely be a suggestion or idea. If it doesn’t work then no patent will be issued. By Novel mean it can’t have been invented or described before anywhere in the world. Yes, I did say anywhere in the world. The official term is Prior Art. This is where the attorney’s fee is worth its weight in gold. Prior Art refers to literature citations for anything related to my invention. A search for Prior Art does indeed include a world-wide search. Just one paragraph in a small, obscure Asian newspaper that even remotely describes my invention in a similar way will nullify the issuing of the patent. Why is this important? I may receive a patent now, but I can lose it later. Ten years down the road a competitor could bring to light a three sentence paragraph in a small publication that describes my invention. This publication was made prior to my invention. This new information could invalidate my patent because it shows there was Prior Art before my invention existed. All for now, stay tuned. 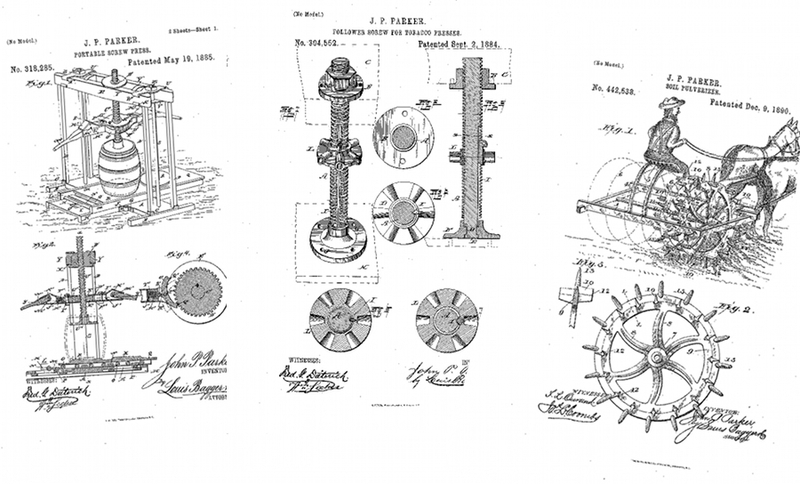 Well, what the heck, let’s start our unit on patents with a little patent history. While we sleep this stuff is going on behind the scenes, everyday. Patents are the engine that drives innovation in our country. They provide the incentive inventors need to reward them for their toils. And we win. So for now, just look these examples and sit back and marvel at them. George Selden was a patent attorney who had no interest in building a road engine, he just wanted a patent on it so everyone would have to pay him a licensing fee. At that time the term of the patent was 17 years from the issue date. By filing amendments he could delay the issue date of the patent until it suited him. This is known as a submarine patent. Selden knew the automobile industry was new and growing. He delayed and delayed the issue date until just the right time. Selden applied for his patent in 1879, but it was not issued until 1895. The automobile manufactures were not aware of him until the patent issued in 1895. The automobile manufactures had formed an association called The Association of Licensed Automotive Manufacturers (ALAM). Selden extracted a licensing fee from everyone in this association except Henry Ford. In 1903 Selden and Ford went to court and Ford lost. Ford won on appeal in 1911. How did he win? He claimed the road engine, as claimed in Selden’s patent, was not a workable engine. He challenged Selden to make one. Selden, who had never made one before, accepted the challenge. It barely sputtered down the road before conking out. Ford claimed Selden’s engine was a 2-stroke engine whereas his was a 4-stroke engine. This turned out to be true and the rest is history. Ripley, Ohio is a small river town on the banks of the Ohio River, about 50 miles southeast of Cincinnati. In the 1800s Ripley and Cincinnati had similar populations. Today, Cincinnati is a large metropolis, while Ripley is still the same quaint, charming river town. What unites those two cities is that in the 19th century they were at the epicenter of the Underground Railroad. The Underground Railroad was the informal network of people, white and black alike, who helped slaves escape to freedom. Many patents have been issued to Ripley citizens over the years. Improved artificial honey, the combination lock, a pencil drawer for a school desk, and an apparatus for delivering and receiving mail, to name a few. So many patents for a town of so few, now that is unusual. Among its more famous citizens was John Parker. Born into slavery in Norfolk, Virginia in 1827, he was walked to Mobile, Alabama and was sold at auction. He purchased his freedom for $1800. He eventually moved to Ripley. By day he ran a successful ironworks business. By night he was a Conductor in the Underground Railroad, crossing the opposite bank of the Ohio River into Kentucky and making daring slave rescues. Once back on the Ohio side of the river, he moved them along the Underground Railroad on their quest for freedom. Many Conductors lived in Ripley, including Reverend John Rankin and Tom Collins. A bounty was placed on Parker’s head, dead or alive. He too was issued patents. Three to be exact. Only a handful of African-Americans, much less slaves, were issued patents before 1900. His patents were for the tobacco press, a follower screw, and a soil pulverizer. Ironically, he died in 1900. To find out more about John Parker visit the John P. Parker House in Ripley, Ohio. It is on the National Register of Historic Landmarks. You will find the town extremely friendly and helpful. Also visit the Underground Railroad Freedom Center in Cincinnati. It is the preeminent center on the Underground Railroad in the United States. They show a 14 minute movie entitled Brothers of the Borderland, hosted by Oprah Winfrey, which highlights the Underground Railroad and the daring rescues of John Parker. Oh my goodness! I almost forgot to tell you about the Digital Millennium Copyright Act of 1996, A.K.A. the DCMA. This is the big dog in the room. I’m also going to convince you why it is worth your while to register your work and obtain a copyright. And while I’m at it I’m going to throw a story your way that highlights the fun and complexities of copyrights. And that, my friends, will be the end of my lessons on copyright. I should delve into patents next, but I’m not going to. Instead I’m going to do things in reverse and give you a blurb on trade secrets. Normally I would educate you on patents first because it helps to understand patents before digging into trade secrets. But I just read an article in today’s Minneapolis StarTribune entitled, Thief says device not worth $4M, that piqued my interest, and moved me to talk about trade secrets first. In that article A Boston Scientific employee downloaded a design for a new medical device they had been designing called the Mustang Plus. It’s some sort of balloon catheter device Boston Scientific was angling to bring to market. So far they have $4.3 million sunk into it. The employee, Aaron Khieu, travelled to Vietnam, allegedly, to set up a manufacturing facility to produce an advanced balloon catheter he would call Snowcat. It’s important to note he worked on the Mustang Plus design team. He argues that the plans he downloaded had no value to him. Prosecutors argue the secret design he downloaded from Boston Scientific was to be the basis for Snowcat. Whether or not Mustang Plus has any real market value is a deciding factor in this case. Would the market for Mustang Plus be adversely affected by Snowcat? Read on, for at the end of this lesson we’ll learn about trade secrets, and what all this fuss is about. There is another rather large issue concerning copyrights that I think you should be aware of. It is the Digital Millennium Copyright Act of 1996 (DMCA). Congress passed this act in order for us to comply with the Berne Convention. The Berne Convention is an international copyright treaty that came into existence in 1888. Yes, 1888. The United States didn’t join the treaty until 1988, one-hundred years later. The United States finally joined this treaty in order to be in copyright alignment with much of the world community. There are three provisions of the DMCA that have caused a lot of gnashing of the teeth. First Amendment Rights and Free Speech have worked it’s way into this debate. There are two sides to this coin and one side says the DMCA gives too much protection to copyright holders. It prevents the legitimate copying of material where the copyright has long since expired. I cannot legally break the encryption on a CD to get access to Shakespeare’s original works which I can lawfully copy. Shakespeare has been dead for 400 years. There is no copyright. The other side says that they have a legitimate right to protect their copyrighted investment. The DMCA protects them from those who would destroy the locks they put on their copyrights and who would allow the world to illegally copy their works and destroy the market for them. There have been many courts cases involving websites that provide tools to illegally download music or break encryption software. Per the DMCA the programmer is guilty of the anti-circumvention component and the person who makes the code available on the internet is guilty of anti-trafficking component. Safe Harbor provisions allow a an ISP or web site to be free of the consequences of vicarious liability or contributory infringement claims if they follow certain notice and take down procedures. You can just imagine the controversy surrounding this. Fill out the form and mail it with a sample of the work of authorship along with a $45 check and whala, you have a copyright. Registration is prima facie evidence of rightful ownership of the copyright in the case of a dispute(I.E. it gives credibility in the eyes of the court as to the rightful owner of a disputed copyright). It allows the copyright holder to sue for statutory damages of up to $30,000 per violation, and without having to prove monetary damages; in select situations the court could change this to $150,000 per violation. The benefits of registration are overwhelming, yet the process is exceedingly easy and inexpensive. In a prior example UMG would not have gotten $118 million out of MP3.com if it were not for registering their copyright. Not a bad return on investment for a measly $45 registration fee that only takes 20 minutes to fill out. Technically you don’t have to put your copyright notice on your product, i.e. the © symbol. It doesn’t hurt because you are advertising that you own the copyright, so why not? For software, I only have to turn in the first 25 pages of my software code, not the whole thing. This protects the software from being pirated because any copies of works collected by the Copyright Office are available for viewing by the public. If I have a website that consists of three html pages and five java servlets and I want to get a copyright on the software code for my website, I must submit a registration for each individual program, meaning in this example, eight registrations. Bikram Choudhury is a world-famous yoga master who immigrated from India over years ago. He runs and operates a worldwide empire of yoga schools. To date there are over 700 schools worldwide with plans for a total of 1600 within the next several years. The yoga he teaches comes from India. There are 84 possible yoga poses. In his schools he teaches a series of 26 of the 84 poses done in a certain sequence, using no music, and with scripted dialogue by the instructor. If Choudhury has his way, every Bikram Yoga studio in the world will soon be franchised and under his control. To start this process, he recently obtained a copyright for his particular sequence of yoga poses — a 90-minute series of 26 postures and two breathing exercises done in a room heated to 105 degrees. Choudhury says that yoga studios that want to continue teaching Bikram Yoga must pay franchise and royalty fees, change their name to Bikram’s Yoga College of India, stop teaching other styles of yoga, use only Bikram-approved dialogue when instructing students, refrain from playing music during classes, and a host of other stipulations. He has issued cease and desist orders, sued some and threatened to sue others. In some cases this is to the tune of $150,000 per infringement. if another studio doesn’t change its name to Bikram’s Yoga College of India, they will be sued for $150,000, and if they play music during lessons, that is another $150,000, etc. Studios are organizing and fighting back. Yoga is yoga and they say Bikram has no right to control others ability to teach yoga. Even the country of India has gotten into the act stating that yoga is their invention and he cannot get a copyright for something they invented and have practiced for 5000 years. In fact they are so upset they are creating a national database of inventions created in India through the centuries so no one can claim other inventions as their own. Bikram counters by saying that his copyright is not for yoga but the selection and arrangement of the 26 poses he uses from the original 84, the fact that he uses no music in his routines, and that the instructors use a very specific script. Is Bikram trying to get his copyright to do the work of a patent? Does his copyright have too much power? Does it truly cover just expression of an idea? Is it clear what exactly is the idea versus what is the expression of the idea? What do you think? Get ready, get set, here we go. Trade Secrets, here we come! What is the best way to protect your invention? Should you go with a patent or a trade secret? Let’s first learn about trade secrets. A trade secret is valuable information that a company or individual wants to keep secret from their competitors. Two examples are Coca-Cola’s soft drink formula and KFC’s secret recipe of 11 herbs and spices. One does not apply for and receive a trade secret. The act of protecting valuable information makes it a trade secret. There is no time limit for the protection a trade secret provides. There is more leeway as to the subject matter of a trade secret than what is allowable for a patent. A trade secret can encompass a formula, compilation, device, program, pattern, process or technique. It is wide open as to what constitutes or defines a trade secret. The trade secret must have a high economic value. The key is that it gives a company an economic advantage over its competitors. How long will it take competitors to discover this secret from legal means? In over 100 years, no one has discovered the Coca-Cola formula. That is a significant advantage. Yes, there are legal ways for competitors to discover secrets; reverse engineering, reading about them in published literature, seeing a demonstration in a public setting, and independently discovering it. But, will Coke’s competitors have to sink a ton of money into discovering the secret formula? Will it take them years to figure it out? Is the barrier to entry high? The Courts are going to look at the secrets and determine if such secrets will give Coca-Cola a large competitive advantage over their competitors. Reasonable security measures must be taken to protect the valuable secret. Are employees aware of and trained on how to protect the secret? Who has access to the information? Does everyone know this information or just a handful of individuals? Is the information locked in a secure vault or is it sitting in a manila folder on someone’s desk in plain view? If a company doesn’t protect their own secret, how can they expect a court to protect it? As an example, KFC, just moved their secret recipe to a high tech vault. This vault is encased in thick concrete blocks. It has motion detectors and cameras that guard the recipe 24/7. While in transit the recipe was in a secure container hand-cuffed to a security expert. Only two KFC executives, at any one time, have access to the recipe. They use multiple vendors. No vendor knows more than just a small piece of the contents of the recipe. In summary a trade secret gives a company a significant competitive and economic advantage and a company must take strong measures to protect its secret. You’ve got your work cut out for you, I’m not holding back. All of what you will read today are important facets of copyright law, and learning the pieces in this lesson will make you the copyright devil when it comes to those who want to use your work without your permission. Fair Use is fun stuff. But it’s not a one size fits all kinda thing. Well, get comfortable in your chair, make sure your cup is filled with your favorite drink and a big bag of snacks is by your side. Here goes. Now let me talk about an exception contained within copyright laws. Under certain circumstances one party may use a copyrighted work under the guise of Fair Use. Fair Use is the “grand daddy” of Clauses when it comes to copyrights. There are four factors used to determine if use of a copyrighted work is considered Fair Use. The purpose of the work; is is for commercial purposes or not-for-profit? The nature of the use; is it a work of fact, fiction or parody? Am I using the work in its original form or have I transformed it into something else? Usually the more I transform the original work into something else the better. The amount used; was the whole work copied or just a small portion? The market effect; Is the market now ruined for the original copyrighted work or did it have an insignificant effect? It is extremely important to understand that courts do not take a cookie cutter approach to applying the four factors. Each case is different and unique, so the courts may apply the four factors differently in each case. You have probably read in the news the downloading of music and video via the internet has resulted in well publicized court cases. Remember that our copyright law has been around for 100 years while the internet has been around for about 15 years. Attorneys and judges are trained in the law, not computers. Needless to say the court system has really struggled to apply laws made in other times to today’s sophisticated high tech world. Here is a small but expensive example. Ouch!! That was an expensive infringement! Similarly the RIAA or Recording Industry Association of America made headlines by suing common, everyday, consumers who downloaded music. They sued high school students, college students, moms, grandmas and everyone else they could. They made examples out of people. The RIAA did not win many friends doing this, but they sure influenced people. Piracy is something they wrestled with for years, but in the end it was enforcement, rather than polite pleas, that worked. They sued these people saying they infringed on their rights for reproduction and distribution per copyright law. The RIAA feels the downloading of music via the internet is under control. Now the current problem is, you guessed it, the illegal downloading of movies and video. How will Hollywood handle this? On an international scale, copyright piracy is a major issue, in China, in particular. Remember that each country has its own sets of laws. Our copyright laws here in the United States do not apply in China. Yet widespread piracy over there affects us in a big way here. What to do? How do we stop piracy over there or get the Chinese government to stop piracy? This is something the governments of the United States and China are battling over now. It all comes down to cash. The people downloading music almost always claim Fair Use. The downloading of music via peer-to-peer networks has resulted in some infamous, well publicized, court cases: Napster, Bit Torrent, Kazaa, and Groekster, to name a few. Napster lost hands down, the rest survived to see another day until recently when the Supreme Court shot them down. Let me examine for you how the Fair Use arguments were made and how the four factors were applied when it comes to peer-to-peer networks. Understanding these Fair Use arguments are instructive because it gets at the issue of who is liable for someone else’s conduct. Peer-to-Peer networks are an excellent example of the struggle of who is liable for someone else’s conduct. For those of you who don’t know how a peer-to-peer network works, let me explain. In all peer-to-peer networks subscribers download the songs they are looking for from other subscribers in the network. They don’t download songs from a central server provided by the operator, but from another subscriber’s computer. Each user has software on their computer provided by the operator of the network. Many subscribers may have the same song on their computer. Each time a subscriber downloads a song onto their computer, that song is now available for another subscriber to download. In this way only one subscriber may have purchased the song, but it spreads to many computers in the network in an exponential fashion. A song spreads to other computers in these peer-to-peer networks literally like a virus does in humans. How did these other peer-to-peer networks escape the fate of Napster, at least for a while? The difference is that these other networks did not have a centralized database of information subscribers tapped into. In fact their networks were completely decentralized. If a subscriber wanted to find a song he would connect directly to another subscriber’s computer which would tell him if the song was on that computer, and if not which other computers to check. This would continue until the subscriber found the song he wanted. He would connect to that particular computer and download the song. Subscribers always dealt with each other directly, both in finding where a song was and downloading. The two fancy terms to come out of the Sony case are time-shifting and substantial non-infringing Fair Use. Time-shifting just means the consumer tapes a show on TV and then watches it later on his VCR. Substantial non-infringing Fair Use means that while the consumer does indeed tape the whole TV show, it is for their own personal use and not for commercial purposes, and thus doesn’t harm the market for the TV show. Another fancy term to make note of is space-shifting, which refers to the portability of a song. This means consumers copy a song from their computer hard-drive to other devices, such as an iPod, with the express intent to listen to the song on the iPod rather than from the computer’s hard drive. Strictly non-commercial private use is the intent. The courts have deemed space-shifting to be Fair Use. On a different day with a different set of judges the outcome might be different. Ironically, not all artists think it is bad for the public to download their music for free. In fact, some artists promote it. Their thinking is that if consumers download their songs for free, it will create band awareness and generate an interested following who will pay to see them in concert. They make their money off their concerts and rely less on song sales. They see the downloading of their songs as a form of advertising. Isn’t it amazing that two groups of artists can take such divergent approaches to the same situation? Let me explain further the terms Vicarious Liability and Contributory Infringement. Einstein had his thought experiments, so we can have them too! Pretend that Bank Robber Bob robs a bank and flees in his car down the interstate freeway from Minnesota to Texas and then over to California. Is the maker of the interstate freeway system liable in some way? After all, the Bank Robber Bob did use the interstate in the carrying out of his crime. He couldn’t have escaped the way he did without the nice interstate freeway system. The maker must have known that bad people would use their interstate freeway system when they build it. Aren’t they liable, at least a little? Yet, how in the world would the maker police the gigantic interstate system with millions of people using it daily? This is the crux of vicarious liability, and it is commonly an issue with internet service providers (ISP). They are the people who create the computer networks that allow us to use the internet world wide. Bad people use their networks too, and cause harm, called torts in the legal world. When someone illegally downloads songs over the internet, they do so over a computer network via an ISP. Like the makers of the interstate freeway system, doesn’t the ISP have some liability? That is the nature of vicarious liability. How much liability does the ISP have when someone causes harm by way of using their network, even though they have no control over peoples’ behavior? This same question props up frequently for website owners. Consider the Bank Robber Bob again. I am the maker of the interstate freeway system and I am getting money via toll roads and billboard advertisements along my system. I know that bad people will use my interstate system, but I also know that the more people that use my system the more money I get from toll roads and billboard advertising. I am even aware that Bank Robber Bob has already used my system to escape from bank heists in Minnesota, but I know he is also planning a bank heist now in California and is going to use my system to escape to Oregon. I also know that other bank robbers are going to follow in the footsteps of Bank Robber Bob and use my system for escapes. Yet, I do not say a peep to the police about what I know, for that would hurt my bottom line. In fact I deliberately give frequent toll use discounts for certain toll roads I know the bank robbers are going to use. More use means more money in my pocket. Yet I make no effort to stop this illegal behavior or say anything to anyone that can. That is the nature of contributory liability. I am aware of illegal activity on my system, yet I say or do nothing to stop it for I profit by this activity. In fact, I kind of encourage it. Aren’t I liable it some way for all of this? To use my ISP example, if I know that certain users are illegally downloading gobs of songs and I do or say nothing to stop them, in part because I profit by their monthly subscription fees, I can held be held liable as I am contributing to the harm committed all the while profiting from this activity that I am aware of and do nothing to stop. In fact I might even encourage this activity given the profit motive for me. As with vicarious liability, website owners frequently deal with this issue too. Can there be more than one copyright for the same thing? Yes, read on! I am a book publisher of mystery novels and I want to create a book that is a collection of mystery novels. Each mystery novel has an existing copyright on it. I will have to get a licensing agreement with each of the individual copyright holders to use their mystery novel in my collection. I can receive a separate copyright for my selection and arrangement of the mystery novels in my collection, but not for those individual novels. I have a licensing agreement with each of them for I need their individual permission. I write a song, and receive a copyright for my song. A music producer takes my song and hires a band to perform my song for an album. He will have to get a license from me so that his band can perform my song because I composed the song. He, however, can get a copyright for the creative arrangement in which his band plays my song and for the way he mixes the production into a final product. When is a Work Considered Published? In the complicated scheme of copyright laws, which law applies to a particular work depends on when that work is published. A work is considered published when the author makes it available to the public on an unrestricted basis. This means that it is possible to distribute or display a work without publishing it if there are significant restrictions placed on what can be done with the work and when it can be shown to others. For example, Andres Miczslova writes an essay called “Blood Bath” about the war in Bosnia, and distributes it to five human rights organizations under a non-exclusive license that places restrictions on their right to disclose the essay’s contents. “Blood Bath” has not been “published” in the copyright sense. If Miczslova authorizes posting of the essay on the Internet, however, it would likely be considered published. It’s a tricky one, but here goes! The Work For Hire clause of the copyright law can throw a wrench in things. Here is how that works. Michael hires me, on a contract basis, to write a computer program for him. He pays me $5000 to do this. So I write the program. The question becomes, who owns that software code, him or me? On the surface, it seems Michael should because he hired me to write the program for him and he paid me $5000 to do so. However, that would be wrong. I am the owner. How can this be? Many years ago, a long, bitter, struggle ensued between book publishers and authors over who owned the rights to the books the authors wrote. The publishers wanted the rights because they bankrolled the authors and took the risk to publish their books. The authors wanted the rights because they felt the publishers had too much dictatorial control over them and were making all the money. A compromise was reached. Here is how this compromise would apply to this example. If I am a regular employee of Michael’s and what I created was with the scope of my regular employment with Michael, then the work belongs to Michael. By regular employee I mean I am employed by Michael in the traditional sense of being an employee, much like a programmer might be an IBM employee and get a yearly salary, benefits, and retirement. I applied for a job, Michael hired me, and I did this work as part of my job. This is the traditional understanding of Work for Hire. The employer owns the copyright of whatever was created by the employer’s employees. The copyright in this situation can last 95-120 years. If I am an independent contractor, hired by Michael, the work belongs to me. Michael contracted with me to do specific work for him and I got paid a sum per my contract. It might be a fixed amount for a specific amount of work or it might be an hourly rate multiplied by the number of hours it took me to accomplish the work. All work created by an independent contractor belongs to the contractor except if that work falls into one of nine categories. Note: In order for the work to belong to the hiring party, and not the contractor, there must be an express written agreement between the two. No written agreement, and the work created in any of these nine categories belong to the independent contractor. A verbal agreement does not count. To recap, for the work to belong to the hiring party it has to fall into one of the 9 categories and an express agreement has to be in writing. If either of these conditions is missing then the work belongs to the independent contractor. For those of you who hire independent contractors don’t be discouraged, but do be aware. Copyright law provides for the transfer of copyrights. To protect your investment you must have in your signed contract with the independent contractor a clause that covers you regarding a Work For Hire arrangement. The language of this clause would state something to the effect that the work done is considered a Work For Hire and belongs to you, the hiring party. In the event the work done is not considered a Work For Hire, then the contractor agrees to fully transfer all copyrights to you. There are a few quirks in the law when a copyright is assigned in a Work for Hire situation. First, the copyright assignment can last between 95 and 120 years rather than the usual 70 years past the life of the author. Second, a copyright assignment can be terminated after only 35 years. This means that when an author assigns a copyright to a publisher the copyright assignment can last for up to 120 years, but the author may terminate the assignment after only 35 years. Yes, it is a little bit confusing. You should consult with an experienced attorney for this. I was personally involved in such a situation in that I was the independent programmer hired to create a website where I had to write a large amount of software code. Nothing between us was put down in writing; It was all verbal. We got involved in an argument over who owned the software. The other party said he owned it because it was his idea, his website. He took the financial risk in paying for the advertising and me for the creation of the website. I claimed it was mine. I spent my blood, sweat, and tears to create the software, not him. I am the one who stayed up until 2am to write it while he was either in bed or on vacation. I was hired to create a website, which I did. He gets the benefit of such a website, not me. The software was mine. Okay, I was to get a percentage of the profits of the website, but he was to receive the overwhelming majority of the profit. He did not know that I was familiar with this Work for Hire clause. In fact he wasn’t familiar at all with copyrights or copyright law. I consulted three different attorneys and learned a valuable lesson that you should learn. The first two attorneys said the code belonged to the other party because he hired me and paid me money to create the website; because the software powers the website, it was his. One of the attorneys indicated that I was more or less morally obligated to give the code to the other party. However, these attorneys were not specialists in the area of Intellectual Property. The third attorney was an expert in Intellectual Property. He asked me why I would want to give the other party a copy of the software. He said the software code was mine. He said the other party might indeed sue me, but he wouldn’t win. This is because of the Work for Hire clause in copyright law and because nothing was ever put in writing. Upon further examination of the copyright laws, my software code did not fit into any of the nine categories of exceptions. The moral of the story is that I should be aware of my rights as an independent contractor, and if I am having heart trouble I shouldn’t go see a Foot Doctor. I should see a Cardiologist. Attorneys have a specialty within the law. If you are having Intellectual Property issues, go see an Intellectual Property Attorney, not an Employment Law Attorney. Go ahead and pay the few extra bucks to see the right Specialist, and be aware of your rights! Okay, it’s time to talk a little more about “expression of an idea” when it comes to copyrights. That one concept alone takes the cake when it comes to confusion as to what a copyright protects, and how a copyright differentiates itself from patents. So let’s dig in. I took my dog, cat, fish, and snake to the baseball game. My dog says, “I am hungry for a hotdog; where is the vendor?” The cat notices the scoreboard and comments that “the pitcher is throwing a prrrfect game!” My little fish is feeling very shy and is blushing shades of red. “Oh I feel so much like I am in a bowl and everyone is watching me” she exclaimed. I didn’t know where my snake went, but I finally see him on the field slithering up to the batter proclaiming “Yer out!! !” The umpire didn’t know what to do; he looked like a cat got his tongue. I looked again. My cat actually did have his tongue! Well the home team won 1-0. My cat is so impressed. He said “They really scratched and clawed their way to victory today.” My dog barked orders to the rest of us and we were on our way home. Farmer Bob took his horse, donkey, cow, and pig to the local soccer match. Once they got there, the horse galloped right to the concession stand proclaiming, “Let’s eat, I am as hungry as a horse!” The donkey saw the score on the board and proclaimed “We are kicking them all over the place.” The cow observed the crowd’s reaction to the score, blushed, and said “I am moooved by the emotion of the crowd.” Farmer Bob was scratching his head trying to figure out what happened to the pig. The pig had waddled down onto the field and head butted a ball into the opponent’s net. The referee took note that the pig got down and dirty when he scored the goal. The home team won. The donkey looked at the opponents and said “What a bunch of jackasses.” The horse encouraged everyone to trot along and they all left for home with Farmer Bob. Pretend for a moment you are the owner of Passage 1 and you come across Passage 2, written by Bob. You talk to Bob and tell him he just copied your paragraph. Bob disagrees. You both agree to let a third party decide. How would you argue your side? How would Bob? Is it easy to formulate your argument? If you switched places with Bob how would you present his side? I have done an exercise similar to this in a number of my classes. The plaintiffs were the owners of passage 1 and the defendants were the owners of passage 2. The Plaintiffs sued the defendants for copyright infringement. Let me briefly tell you what happened in two of my classes. The only goal of each side was to persuade the judge regarding their point of view. In this class I asked them how much time they needed to figure out their arguments. They said they did not need any time; it was a slam dunk. I asked if they were sure. Doubts set in on each side and they ended up needing 15 additional minutes to organize their arguments. They realized it wasn’t obvious how to argue their point-of-view. They realized it is a fuzzy jagged line going all over the place, not a straight smooth line. The plaintiffs argued that the defendants did nothing more than copy their paragraph and change the words around so it didn’t look like their original paragraph. Same story, same style, same everything except for switching some words. The defendants argued that the concept of animals going to an event and speaking has been around for hundreds of years. Plaintiffs don’t own the rights to this kind of story. It didn’t matter if the concept of their paragraph was the same as the plaintiff’s, the story was told with different animals using different dialogue at a different event. In the second class it went pretty much the same way. I had one defendant who attempted to bribe the judge with a quarter. The judge decided that if the defendant was going to resort to bribes then most likely he was guilty of copying. Another judge read the two paragraphs and more or less decided in his own mind that passage 2 was a copy of passage 1 and found the Defendant guilty. I tallied up the judges decisions and in both classes the judges ruled for the plaintiff half of the time and ruled for the defendant half of the time. I pointed out we have the same judges hearing the same case a couple of times over, yet ruling differently in each case for different reasons. The plaintiff and defendant were arguing over what is an idea and what is an expression of an idea. The plaintiff was arguing that his paragraph was an expression of an idea and the defendant was copying the artistic expression in his paragraph. The defendant argued that the plaintiff’s paragraph was just ideas, and copyrights don’t protect ideas, only patents do. Therefore, he had every right to use those ideas in his paragraph. Think of copyright, a.k.a. expression of an idea, as “storytelling.” If I am the Plaintiff, I am saying there are many ways to tell the story of four speaking animals going to a sporting event. If the Defendant tells the story exactly the same way I do, then he has violated my copyright. He has infringed upon my “storytelling” of four speaking animals going to a sporting event. I am saying the Defendant can also tell the story of four speaking animals going to a sporting event, he just can’t tell the story the same way I do. He cannot copy my “expression of an idea.” That is what copyright is all about. This exercise illustrates the utter complexity of deciding what constitutes an idea and what is an expression of an idea. Remember that a patent protects an idea while a copyright protects the expression of an idea. Now multiply the complexity of the case by 1000% and you can appreciate the difficulties in real court cases. Remember too that if I want to protect my idea and the expression of my idea I can get a patent and copyright for the same thing. This is a frequent strategy for protecting computer programs. Get a patent to cover the idea or algorithm the software implements and get a copyright to protect the actual software code itself. I’ve decided to begin these installments with a short blurb about copyrights. The traditional intent of copyright law is to protect authors and artists, and this is the facet of intellectual property they will bump into the most. The Expression of an Idea? There is a definite distinction between a patent and copyright, but identifying that dividing line can be a source of confusion. Where a patent protects an idea, a copyright protects the expression of an idea, but not the idea itself. I know, I know, why are they doing this to us? As we go along some timely examples will help to clear this up One of the struggles with copyright law is how to apply laws intended for one purpose to today’s sophisticated high tech environment. Copyrights currently extend protection for 70 years past the life of the author. There are variations of this, but this is the traditional amount of time afforded copyright holders. The term “author” means the copyright holder. I want to emphasize that the intent of Congress and our intellectual property system is that inventors and creators eventually share their work with the public. When copyrights expire, the work becomes part of the public domain. The legalese in our copyright laws states that one may get a copyright for original works of authorship fixed in any tangible medium of expression. Part of the qualification for getting a copyright is that the work must have a “modicum of creativity.” (Feist Publication vs. Rural Telephone, 1991). Therefore, to get a copyright I must create a work that is original, has a minimum amount of creativity, and I must put it on a tangible medium, meaning on paper or disk or something hard that I can touch and feel. I hate to admit this, but here goes. I applied for a copyright for a T-shirt design that I had sold years earlier. I was denied! Why? My T-shirt design did not contain enough creative elements in it, i.e., the Patent and Trademark Office (PTO) didn’t feel it had a “modicum of creativity.” Oh snap. Facts and lists are not copyrightable because these do not contain any sort of creativity. For example, I am not able to get a copyright for a phone book. The courts have denied copyright protection for facts even though a lot of hard work went into getting those facts. They must contain some amount of original, creative expression. Feist Publication vs. Rural Telephone, 1991, is the classic case that illustrates this. Is it okay to take common, ordinary things and put them together to get a copyright for the arrangement of those things? Yes! The individual things by themselves are not copyrightable, but the selection and arrangement of them is, because there is some creative originality going on there. As an example I might take a calendar, a picture of a lake, and information from a phone book and combine them to create a fancy poster reminding people to pick up their new phone book. None of the individual components would be granted copyright protection, but the resulting product, my poster, would qualify for copyright protection. Here is one of those timely examples that illustrate the difficulty in figuring out what is an idea and what is the expression of an idea. Bike racks. You see them everywhere, the ones that look like a sine wave. Did you know that those bike racks were the central figure in a copyright case? At one point I was an adjunct professor for a business college and taught a survey class in intellectual property. I had more fun than any human being should have teaching that class and the fun of it lingers today. The text book we used was something like 750 pages, written by an intellectual property attorney. Informative and full of fabulously detailed information, it proved too overwhelming for my class. The weekly reading assignments were something like 200 pages. I’d come in to class full of fire, but my students had that deer in the headlights look. As soon as I attempted to engage them in discussion I’d see them with the textbook on their lap flipping pages, acting like, yeah, they read it. I knew they didn’t. After informing them I didn’t bite and exhorting them to tell me the truth they finally admitted they attempted to do the readings, but it was too much and too overwhelming and they were lost in all the details. I put them at ease and together we spent the rest of the class pulling out important points from that sea of information and summarizing them on the whiteboard. At St. Thomas I did a Masters project on trademarks, and at that time my project advisor encouraged me to turn my project into a book. For years his admonitions ping ponged around my brain. After teaching those classes and and seeing first hand students’ struggles in assimilating and grasping the wealth of information, I decided to expand the scope and write a book that takes all that complex information about intellectual property and put it into simple form that anybody could understand. It mimics what we did in those classes. The result was GUIDE TO INTELLECTUAL PROPERTY. And I’ll be using this as a basis for the information I’ll be sharing on this blog. Intellectual property sits in the background of the lives we lead, whether we know it or not. Everytime we drink a can of Coca-Cola® or eat a Snickers® bar or use an iPhone® smartphone or drive a Ford automobile or read a Stephen King novel or type a memo using Microsoft Word® intellectual property is at work. At its core intellectual property serves to protect those who have created something, to allow them to profit from their ingenuity and innovation. On the surface we may not be aware of or understand or even care about intellectual property. But its there, in the background, working day and night, whether we’re wide awake or sleeping peacefully. Everyday. Every year. Most people are confused as to what a patent, copyright, trademark or trade secret even are. It’s easy to get confused. The first thing to remember is that intellectual property is an umbrella of protection for something we create, and that a patent, copyright, trademark, and trade secret are each pieces in the puzzle of that protection. Each has its own unique purpose, yet we can use these pieces in conjunction with each other to achieve the protection we desire. To begin, patents and copyrights emanate from a single line in our constitution. Thomas Jefferson was our first patent commissioner and his way of thinking characterizes our intellectual property system. The Patent and Trademark Office (PTO) was created in 1802 in Washington D.C., and approves and denies all patent applications.